Earlier this year I had the opportunity to go on missions to Washington DC and Marseille and I was able to engage in valuable and constructive discussions with senior government officials and fellow civil society leaders. Besides this, I had the pleasure of meeting with some exceptionally impressive individual leaders who are unwaveringly committed to the promotion of human rights in their communities and I learned a huge amount from my interactions with these individuals. In particular, it was fantastic to meet with some extraordinary women leaders who are providing a shining example for women in leadership in civil society and more generally around the world. 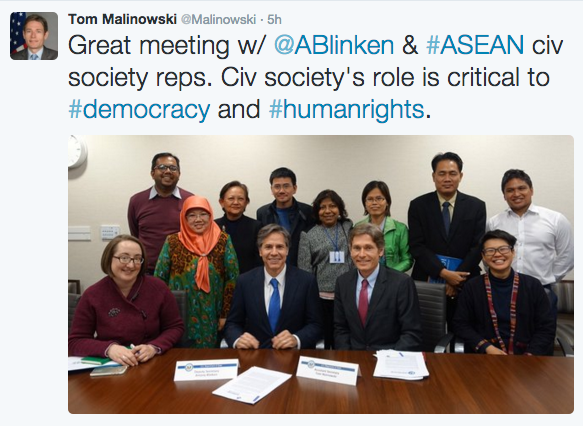 As part of my mission to Washington DC between 09 and 12 February, it was a privilege to be invited to the White House to meet with US National Security Advisor Susan Rice and nine civil society leaders from South East Asia as part of the ‘Stand with Civil Society: ASEAN Consultations’ in advance of the US-ASEAN Summit. The meeting was an excellent opportunity to discuss problems facing civil society and share experiences and strategies with fellow civil society leaders. Other than the senior level of the meeting, I was most struck by the exceptionally respectful, thoughtful and perceptive style of leadership and personality of Susan Rice during the meeting, which was at times fairly frantic. 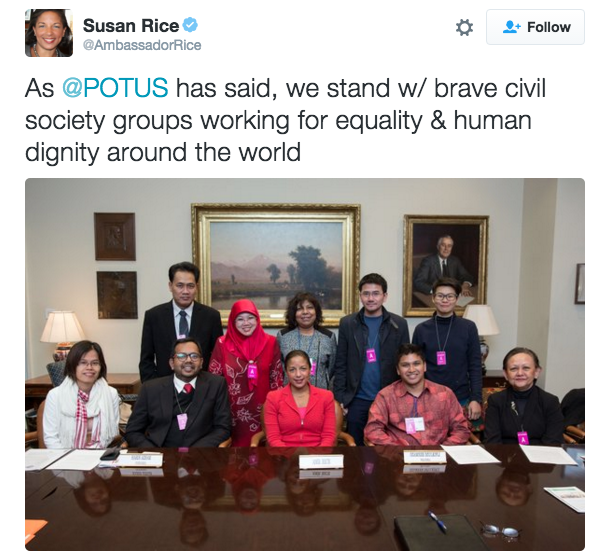 For example, Susan Rice repeatedly encouraged an activist from a country in which activists are often repressed to contribute her thoughts and experiences. She was reluctant to speak because some of the other participants in the meeting continuously tried to speak over her and also partly because of her country’s political culture. It was impressive to see how Susan Rice ensured all the participants at the meeting were given the space and opportunity to freely express themselves and her considerate approach to encouraging the discussion of diverse perspectives and experiences was remarkable. The perceptive leadership style of Susan Rice and the conscientious manner in which she conducts herself are truly inspiring and make her a wonderful example for women leaders around the world. Following the meeting, the US National Security advisor issued a statement reiterating the “United States’ steadfast commitment to sustaining and supporting civil society in Southeast Asia and around the world”. In addition, I also had the opportunity to meet with other senior government officials, including Deputy Secretary Anthony Blinken, Assistant Secretary Tom Malinowski, and Deputy Assistant Secretary Scott Busby, and prominent human rights organizations, such as Human Rights Watch, the American Bar Association’s Center for Human Rights, the Center for Strategic and International Studies, and the International Center for Not-for-Profit Law. These meetings were very useful as we were able to discuss human rights abuses in Cambodia as well as the domestic and international strategies that can be used to challenge such violations. Alongside these meetings, I was invited to deliver a speech at an event organized by the association of Cambodian Americans for Human Rights and Democracy. With roughly 300 members of the Cambodian diaspora attending the Valentine’s Day celebration, it was the perfect opportunity for me to stress the importance of the active participation of every Cambodian citizen regardless of who and where we are, to give back to society and this could be the perfect expression of our solidarity and love. I was also interviewed by Voice of America Cambodia. I then visited Marseille in France in order to attend an event focused on digital rights and advocacy. 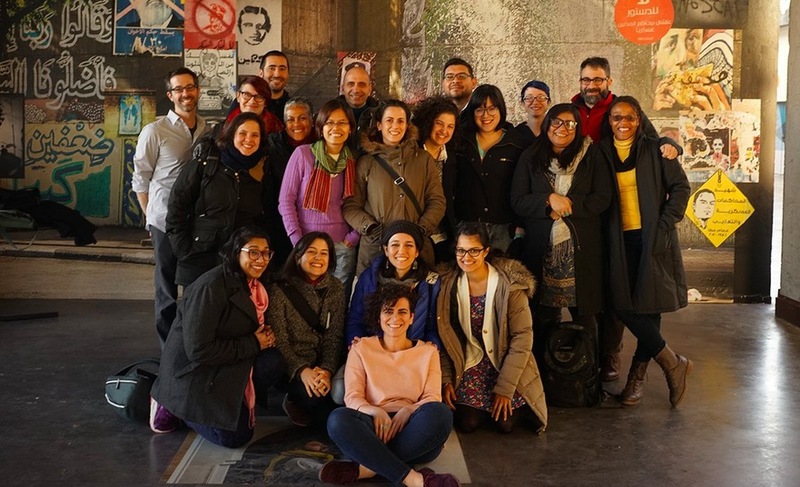 as part of Global Voices Exchange, ‪#‎GVeX, aimed at developing training and mentoring frameworks for the practice of advocacy, both online and offline, in the global south. Throughout the five day training and mentoring program for advocacy strategies, I was lucky enough to meet with remarkable individuals who all shared the same passion and common values to support better governance, enable a healthy environment for civil society and empowering individuals to advocate for basic freedoms in their communities. Their determination and enthusiasm to make a difference and help to build a prosperous and liberal society in their communities was truly remarkable and I personally learned a huge amount from hearing about their experiences. During both of these missions it was an honor to meet with a wide variety of inspirational leaders, from the White House to the activists gathered in Marseille. The determination of so many people with different backgrounds to contribute to the promotion of a liberal democracy and human rights in their own communities was very encouraging. It was especially impressive to meet with some extraordinary women leaders who conduct themselves in an extremely resolute and perceptive manner in order to ensure a wide variety of views and perspectives are properly heard. This entry was posted in Fundamental Freedoms, Uncategorized, Women's Rights by Cambodian Center for Human Rights. Bookmark the permalink. CCHR is a leading non-aligned, independent, non-governmental organization that works to promote and protect democracy and respect for human rights – primarily civil and political rights - in Cambodia. We empower civil society to claim its rights and drive change; and through detailed research and analysis we develop innovative policy, and advocate for its implementation. Great!!! we need more participation from women to help building this country. Could not agree more. Women can do just about everything that men can.